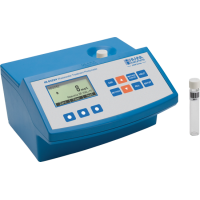 HI83224-02 is a compact, laboratory photometer which was designed to run quickly and efficiently wastewater analysis. With HI83224-02, can all nitrogen, phosphate and COD parameters determine and free and total chlorine. Control and monitoring of your water treatment for the HI83224-02 no problem. He is also equipped with a barcode reader to identify in order to avoid errors. 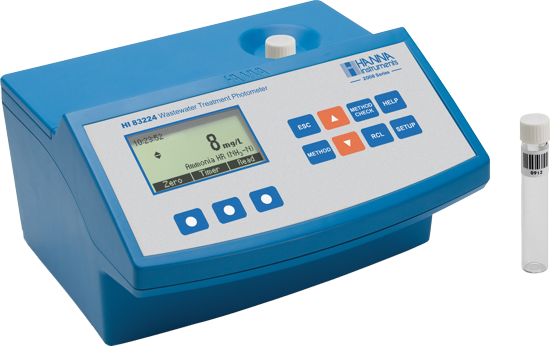 The HI 83224 is a multiparameter bench photometer that has 15 methods for measurement of COD, chlorine, nitrate, nitrogen and phosphorus. Automatic recognition of bar coded samples is an exciting feature of the HI 83224. This advanced meter scans each vial inserted into the vialholder and automatically identifies the sample method and range. This feature eliminates errors and simplifies the testing process. The HI 83224 features a powerful interactive user support system that assists you before, during and after analysis. On-screen tutorials guide you through set-up, calibration and measurement while context sensitive help screens are available at a push of a button. HI 83224 to assure that the vial and method are the same. Users have the choice of operating the HI 83224 in automatic mode, semi-automatic mode and manual mode. HI 83224 can log and recall up to 200 different measurements. Stored data includes parameter, test results, sample number, lot number, instrument id, date and time. HI 83224 bench photometer can be connected to a PC via USB. The HI 92000 Windows® compatible software (optional) aids users in managing data. Includes all standard cuvette tests for nitrogen, phosphorus , COD and free/total chlorine . Transfer data to your PC at any time via the USB output . Built adapter for the vials . Data management to 200 measurements .